As my CSA vegetables arrive each week, I get excited thinking of what new foods I'll discover (this week I got kohlrabi, which I've never had before, and can't wait to try), and what new recipes I'll get to make. Yesterday marked my third week of veggies from my CSA and so far it's been so so wonderful! Lettuces, kale, rhubarb, strawberries, peas, and so far my most favorite... garlic scapes! These twisted little tangles of garlicy heaven arrived in last weeks box, and I was stumped as to what to do with them. A quick google search led me to recipes that either used them chopped and sauteed, or puréed as a pesto, which is what I ended up doing. I threw the 4 scapes I had, chopped up, into a food processor, with a scant 1/4 cup of pine nuts, and a pinch of salt, and blended them up. Drizziling in enough olive oil to make a nice pesto-y consistency finished it off... and my god... the taste. THE TASTE! Not overpowering in the least. Mellow, but likely one of the most insanely delicious things I've ever eaten. I'm bummed that the scape season is so short, and will be stocking up on scapes this weekend at the farmers market. Once I made the pesto, I had to put it on something. 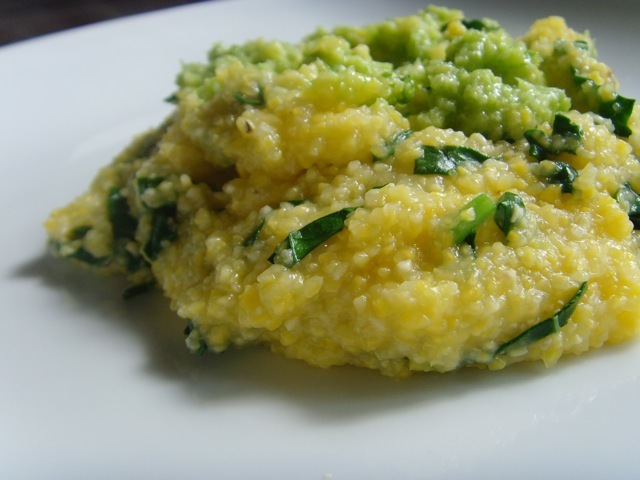 And that something with delicious, soft polenta. This could not have been a more simple, more delish dish if i tried! I threw in some ribboned lacinato kale, also from the CSA box that week, while the polenta was cooking, but close to the end. I highly, HIGHLY recommend everyone go out NOW to their farmers markets and pick up some scapes. 1. In a medium saucepan, bring water, and salt to a boil. Slowly stir in the cornmeal, stirring constantly with a long wooden spoon, until thickened. 2. Add in kale ribbons, and cook a few minutes more, until fairly thick. 3. Either dollop on top, or mix in 1 tablespoon of the garlic scape pesto. 1. Add scapes, pine nuts, and salt to a food processor and pulse until fully combined and no large pieces remain. With the blades running, slowly drizzle in enough olive oil to achieve the desired consistency.